One of our large commercial accounts in Lakewood Ranch, FL. called us Thursday afternoon with a last minute request for a floor cleaning. 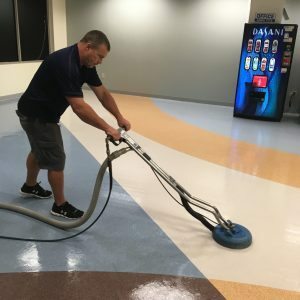 They were replacing vending machines in a cafeteria and thought it would be nice to have the floors cleaned before the new ones arrived Saturday morning. This particular floor was a new technology in vinyl flooring and was something we had to research before tackling. In order to complete this task we had to move quickly to get the proper tools and products that this floor required. Our team worked late into the evening Friday night to make this floor sparkle for Saturday Morning!